January 22nd 2019. Delft, the Netherlands. Bringing a rogue drone down from the sky is no mean feat. Hacking, however, may offer an effective and, even safe, solution.This theory will be put to the test at DroneClash 2019, on March 16th in Katwijk, the Netherlands. DroneClash is a fun and spectacular competition. A competition with the serious aim of accelerating counter drone-technology. 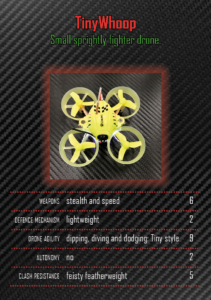 DroneClash debuted in February 2018. Just like last year, DroneClash 2019 will see teams of drone developers and hobbyists do battle in their quest to win a share of €50,000 in prize money. The aim of the game is to down the opponent’s Queen drone using specially-engineered fighter drones. Anything goes, with one exception: no jamming. Guns, nets, flamethrowers and other bombastic weapons are all expected to be on show at this year’s competition. Impressive flying skills are expected to feature heavily too, with a number of teams in this year’s competition hailing from the FPV (First Person View) drone racing scene. But the DroneClash organisers also want to encourage hacking as a feasible counter-drone technology. At random intervals throughout the day, a rogue TinyWhoop drone will fly in the DroneClash hangar, and members of the audience will be invited to participate in hacking it down. The speediest hackers will win a share of the 1,000 Euro prize pot. TinyWhoops are a hugely popular off-the shelf brand of drones. They are renowned for their tiny stature – weighing in at less than 100 grams, which also makes them safe to use. They are also relatively affordable, costing around 50 Euros. This makes them a very popular choice for hobbyists. TinyWhoops may well differ from standard race drones when it comes to size, but when it comes to the electronics inside these diminutive drones, they are not so different from bigger (and therefore more dangerous) drones that could attack airports or other possible targets. As such, they are a safe, but suitable target for a mass hacking experiment. Visitors to DroneClash 2019 will be invited to sign up in advance for the TinyWhoop hacking challenge by emailing hacking@droneclash.nl . The eager drone disablers will then be given access to an open-source hacking code, developed by Freek van Tienen. Van Tienen, who works as a researcher at the Delft University of Technology was a member of the DroneClash 2018 FBCT2 team. The team was awarded a special innovation award for their hacking of competitor drones. For many, the word “hacking” is synonymous with criminal activity, but white hat (or ethical) hacking has an important role to play in exposing security flaws and strengthening systems. When it comes to drones, hacking has potential both as a means of detecting nefarious drones and as a way to take action in a precise and targeted way. For example, instead of having to go through the potentially lengthy process of confirming drone sightings, clearing an area and firing some sort of counter-drone weapon, a hacker could potentially take over the command of an approaching rogue drone, redirect and land it safely, where it could be investigated. For DroneClash visitors not quite ready to don a white hat, fear not! There will still be a chance to join in the challenge of trying to down a TinyWhoop. Children and adults alike are encouraged to come to DroneClash armed with their own fun (but safe) counter-drone invention – whether it be a bat and ball or a telescopic drone-snatcher. Nothing sharp or explosive please. DroneClash’s Flyin’ Amber. AKA events manager, Amber Marijs. Flyin’ Amber is the pseudonym of DroneClash’s event manager – our very own Amber Marijs. With a degree in aeronautics and a career that has involved rollercoasters and scaffolding, Flyin’ Amber has always been excited by things that fly and things that are, mmmm, high. Just like drones. Over the last five years, Flyin’ Amber has become something of a drone expert thanks to the infectious enthusiasm of her drone-designing and flying friends at TU Delft’s MAVLab. In 2018, Amber was able to put her enthusiasm into practice by helping organise the first ever DroneClash. 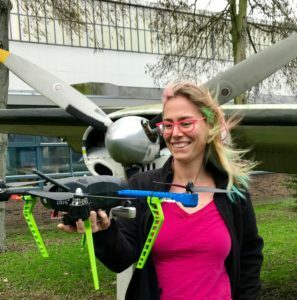 This year she is dedicated not only to making DroneClash 2019 bigger and better but also spreading the news of counter-drone developments through these blog posts. Come back for more!